We hope everyone is having a fabulous holiday weekend! We can't wait to share with you how we've kicked off our summer (and trust us, we know how to kick off a summer) on Tuesday for Share Your Summer, but first we would like to give you a sneak peek at next month's book club selection. We are changing things up for June's book club read, and have decided to have a few co-hosts. We've joined up with our lovely friend Lindsey at The Nashville Mom, Krystal at Simply Girly, and the fabulous ladies over at Savvy Sassy Moms. All of us are super excited to announce our pick, The Fringe Hours by Jessica N. Turner. Ever get to the end of the day and realize you did nothing for you? 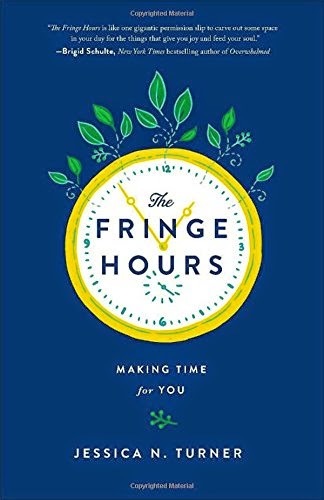 In this practical and liberating book, Jessica N. Turner empowers you to take back the fringe hours--those little pockets of time you already have in your day--in order to make time for your passions and practice self-care. Based on original research, The Fringe Hours helps you overcome common hurdles that prevent women from taking time for themselves regularly. You'll also discover tips for maximizing the time you have and discover how living this lifestyle makes you a better wife, mother, and friend. We plan to discuss the book throughout the next couple of weeks with you guys virtually via Facebook - join the group HERE - and then as usual will discuss our final thoughts with you here July 1st. We have some fun and exciting things planned along the way so we hope you can join us! Pop in and out when you like. We can't wait to hear your thoughts and read this along with you! I received these products for review as part of the Savvy Sassy Moms Product Scouts program. All opinions are my own. I'm so excited to dive into this book with everyone! Jen, yay! Can't wait to hear your thoughts! Share Your Summer: Summer Kick Off!